In Germany, the neo-Nazi party NPD employed the slogan in their program for the state elections of Saxony some 10 years ago. Then prime minister of Hesse, Roland Koch, triggered a public outcry in 2006 by stating that nothing remained of the ancient Native American cultures thanks to the American settlement but that we Germans are “more than the Indians,” thus co-victimizing with and denigrating Native Americans at the same time. Koch is a member of the CDU (Merkel’s party); its Hessian branch has a reputation for its conservatism, and many German newspapers pointed out the obvious similarities between Koch’s and the neo-Nazis’ arguments (most of the previous examples are discussed in this German-language article of the Swiss Tagesanzeiger). 1) The banner voices opposition “against US imperialism.” Of course, this has been a popular trope in German cultural pessimism since the late 1800s, especially where co-victimization with Native Americans is concerned. These German texts have argued “first, Americans destroyed Indian cultures, and now they are trying to do the same thing to us.” You could find this argument among Indianthusiasts around 1900 as much as among proponents of völkisch ideology who provided the breeding ground for the Nazis. Of course, the argument also worked both in communist East Germany and among the West German radical left. 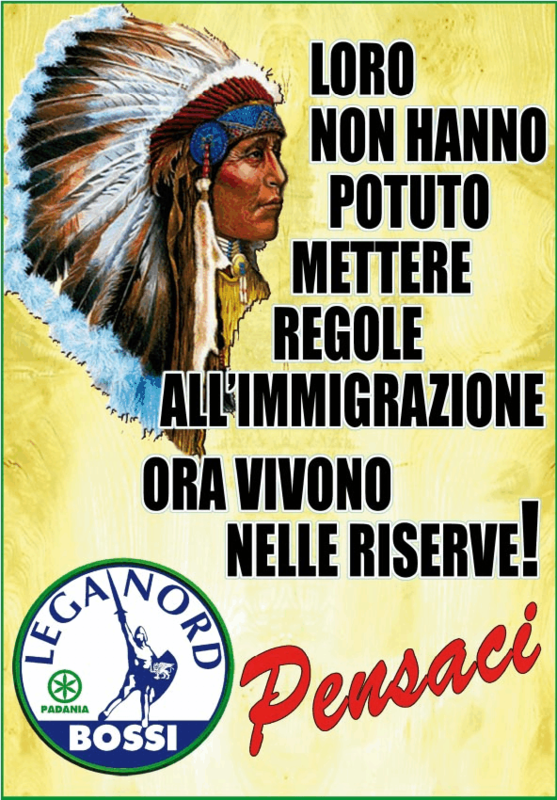 3) The banner also decries “rainbow racism” (Regenbogen-Rassismus) This brings us back to the notion of Germans and Indians as fellow victims. It adds that “rainbow racism” means “genocide,” most likely against white people or Germans. Thus, it seems to allude to the notion of ‘Volkstod‘, the demise of German peoplehood through multiculturalism that is currently a buzzword among neo-Nazis and that I discussed in an earlier post. Although this protester does not explicitly use the slogan “Indians couldn’t stop immigration,” the combination of Sitting Bull T-shirt and “rainbow racism” represents this argument clearly enough. Obviously, this ignores any historical precedence of the degree of inclusiveness within North American tribal societies; they had to be inclusive and adopt members of other tribes and other races into their communities if they wanted to survive in a harsh environment, threatened both by invaders’ military forces and their diseases. They simply could not afford to be xenophobic racists. The “Indians couldn’t stop immigration” argument pictures the history of Westward expansion on the North American continent as a gigantic racial conflict, or even race war, of whites against Native Americans which the latter, in this reading, had to lose because the tribes didn’t unite as a race, because they were not race-conscious enough. The Nazis stressed this over and over as a cautionary tale: Nazi-Germany had a chance to survive, they argued, because it had overcome the internal strife of the Weimar years by uniting under Hitler. In countless speeches and novels promoted by the Nazis, then, Hitler was compared to both Arminius, the Cherusci leader who united the Germanic tribes and destroyed three Roman legions in the Battle of Teutoburg Forest (9 AD) which ended Roman intrusion. Both were compared to Tecumseh, whose pan-Indian movement united previously quarreling tribes in the early 1800s: the German novels of the 1930s portrayed Tecumseh as a ruthless dictator who sought to lead the (mindless) Indian masses toward redemption, only to be cast down by betrayal at the hands of the devious English. In both the Arminius, Tecumseh, and Hitler arguments, the threat to peoplehood is exactly what this protester’s banner proclaims: “genocide”, that is, “Volkstod” through alien intrusion and the infusion of alien culture, technology, and ideas. For racists and völkisch nationalists, culture is an inherent part of peoplehood and it does not mix with outsiders. Thus, immigration, miscegenation, and cohabitation among cultures, in their understanding, will always lead to conflict and, eventually to the demise of peoplehood. So, without using the actual slogan about Indians and immigration, this protester promotes a tradition of nationalism and racism in German Indianthusiasm that helped the Nazis rein in a very popular movement for their propaganda efforts. It is a revelation to see that the same argument is obviously still very powerful to promote nationalist and racist ideology in the twenty-first century. Since my first post on this topic in May, I have done a bit of research on Indian imagery in racist arguments regarding the current debate on immigration and the refugee crisis. I knew that neo-Nazis followed in the tradition of their grandfathers to co-victimize with Native Americans by placing the near-extermination of the buffalo and the massacres against Native Americans on the same level as the American bombing campaigns against German cities during World War II. I was not aware, though, that the old nationalist/Nazi notion of German Indigeneity was alive and well, too, that both conservatives and neo-Nazis use it for nationalist and racist statements, and that these statements are so widespread. There are quite a few video clips with a message similar to the one on the Cherokee girl and the Green party leader Claudia Roth I described in Part I. I do not know who is behind the Cherokee/Roth video, nor their party affiliations, but the gist of the video matches many statements from the neo-Nazi party NPD (“National Democrats”). 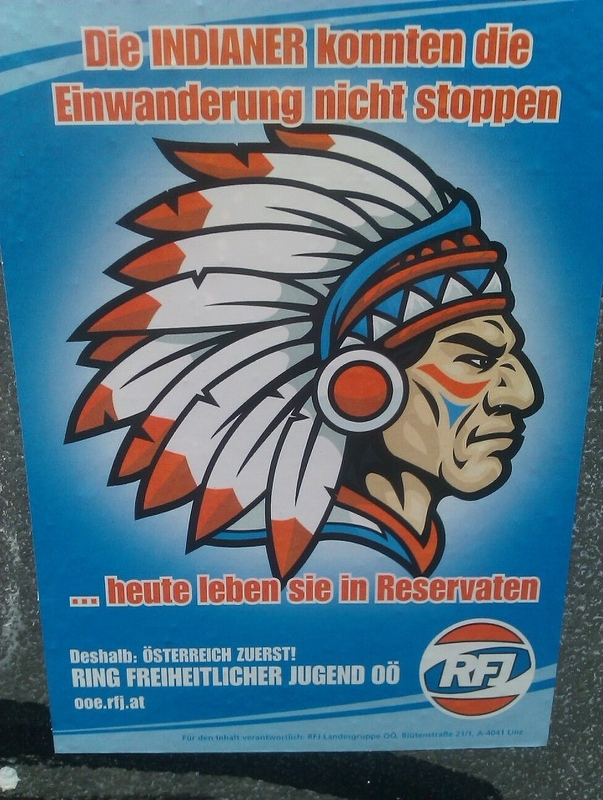 The Saxon NPD used a version of the slogan “The Indians couldn’t stop immigration, and now they live on reservations” on their program for the Saxon state elections some ten years ago. Also, a Saxon historian in the NPD argued that “The ideologies of multiculturalism promote by all available means a massive land grab by people who are alien to our culture and race, which will turn us Germans into the Indians of the twenty-first century.” This notion reinforces the paranoid concept of Volkstod, the demise of peoplehood, which is supposedly brought on by miscegenation and the mixing of cultures. As discussed in Part I, in a völkisch reading, cultures are supposedly inherent elements of group identity determined by both blood ties and by the natural environment, and can thus neither be shared or learned, and don’t mix without conflict. So, the massive influx of immigrants, in this perspective, destroys German culture and, eventually, the German people. “One cannot convey culture, which is a general expression of a particular people’s life, to any other people with completely different mental predispositions. This would, at best, be possible in a so-called international civilization, which, however, relates to culture like jazz music to a Beethoven symphony” (Hitlers Zweites Buch 166). In this reading, then, jazz, as a representative of American (international) and, thus, alien civilization, threatened the integrity of German culture and German peoplehood already in the 1920s. Back to Indians and neo-Nazis, though. 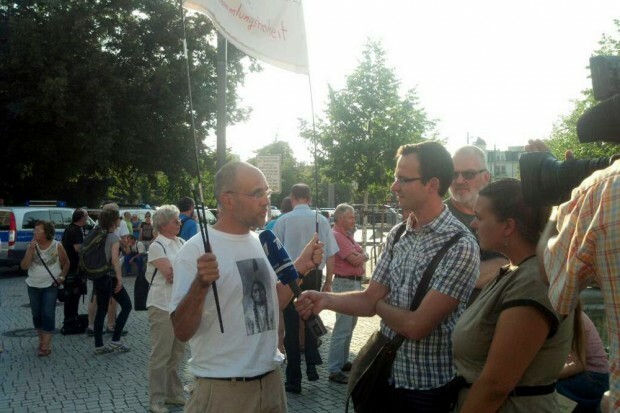 In 2011, the Bremen chapter of the NPD published a short campaign ad for the parliament of the Bremen city state, the Bürgerschaft. In this, as in our Cherokee/Roth example, an animated film explains the history of American settlement, starting with the landing of the Mayflower. The video should convey its meaning to you even if you don’t speak German; the text lines are scarce and the images speak mostly for themselves. It is the same story of naive Indians who help the first hungry and huddled immigrants but are pushed aside eventually because the numbers of aliens become overwhelming and because the immigrants turn out to be rowdyish invaders. In the end, the Indians are crammed onto some small patches of land, i.e., the reservations, that have “do not feed” signs posted at their borders. Now that it is too late, the Indians in this clip conclude: “We should have founded a national Indian party” (Wir hätten eine nationale Indianerpartei gründen sollen). The clip is significant not only because of the hilarious notion of the NPD as the “National Indian Party” that caused great joy among liberals, but also it once more openly promotes racism and xenophobia as the only measure to protect both German culture and peoplehood. I had heard similar jokes and seen similar posters and cartoons (“Who’s the illegal immigrant here, Pilgrim? !”) from American liberals and Native American activists who use them against American anti-immigrant conservatives. I always marvel at how easily reference to Native Americans can be used for both sides of the argument if you only change the setting and once you take into account the German tradition of imagining themselves as the Indians of Europe and, therefore, as soul mates of Native Americans. The APB was founded by the state of Bavaria in 1957 to promote political education and thus strengthen democratic practice in Bavaria. It offers space for academic meetings and public events. It has hosted a number of annual meetings of historians in the German Association for American Studies, so I have been visiting a few times already. Its location directly adjacent to Lake Starnberg (the fifth-largest in Germany) makes it an ideal place to combine work and recreation. The symposium gathered scholars in history, political sciences, and literature to discuss German-American relations since the end of World War II. Presentations reflected on the ups and downs in the relationship and investigated historical and cultural factors influencing how Germans perceive, and have perceived, America. In my presentation, I discussed German self-perception via the notions of Indigeneity and nationalism that were major issues for my dissertation. Initially, I had planned to present a broad overview on how German Indianthusiasm shaped German perceptions of the US as a “common enemy” of Germans and Native Americans, but also as a place of yearning, before and after 1945. Yet, looking for more recent examples of how Indian imagery serves to portray the US in German pop culture, I focused on notions of national identity. Nationalism being my chief approach for the dissertation, I found numerous examples of nationalist and völkisch thinking in Indian images even after World War II. “Völkisch” means notions of peoplehood based on essentialist perceptions of national identity: the idea that character traits and one’s sense of belonging are determined by blood and by the natural environment. Völkisch thought is, thus, a basis for blood-and-soil ideology. If group identity is determined by blood, then it is almost impossible to come to “belong” as an outsider (or as an immigrant, for that matter). Unlike the tradition of American identity that allows for immigrants to become Americans through assimilation/integration, völkisch thought would deny the possibility of someone ‘learning’ to be a German and, being determined by blood, ‘German culture’ is perceived to be inherent in peoplehood, so it cannot be learned or shared with other peoples, either. This notion, of course, breeds xenophobia and racism. I would argue that part of this philosophy can still be seen in the current term “people with a migration background” (Menschen mit Migrationshintergrund), employed to be more politically correct than “foreigner/alien” (Ausländer)―it nevertheless states that the depicted person, their parent or grandparent generation, was not born a German, and thus the following generations bear the taint of otherness. Traces of it are also still present in the ongoing legislation ruling that, even when born in Germany, you are not automatically a German citizen if born to immigrant parents. Looking for recent examples of such völkisch anti-American argumentation, I encountered debates on immigration in Germany. Conservatives, neo-Nazis, and, most recently, proponents of the anti-Islamic so-called PEGIDA movement (“Patriotic Europeans Against the Islamization of the West”) have referred to Native Americans as examples of how Germans, if they didn’t stop immigration, would end up “like the Indians”―living on reservations, being strangers on their own land, and having their culture destroyed by invading waves of strangers―in the völkisch sense, of ‘the other,’ of those who don’t belong because they are alien and cannot become ‘like us.’ Being ‘us,’ after all, cannot be learned in this reading of peoplehood, you have to be born into it. 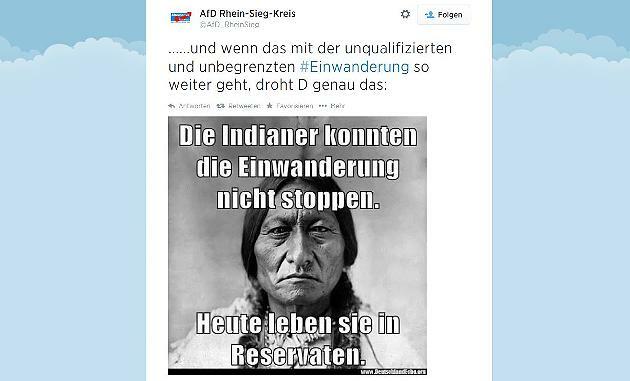 One example was a tweet from a county representative of the new political party Alternative für Deutschland (AfD), using this photograph of Sitting Bull to state “The Indians could not stop immigration. 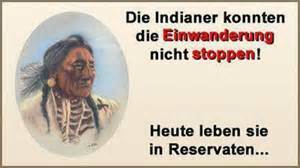 Now they live on reservations.” This summer 2014 tweet comments that, if immigration into Germany continues, Germans will end up being strangers in their own country in the same way. An even worse example is a YouTube clip featuring the leading figure of the Green Party, Claudia Roth, who encounters a (stereotypically clad) Cherokee “exchange student” in Berlin. Offering her German citizenship on the spot (and thus indicating that the Greens will naturalize any foreigner for the sake of multiculturalism), Roth learns that the Cherokee girl intends to go back home. The girl then tells Roth, who inquires about her experience as an ethnic minority, that her people had once lived by themselves and in peace when strangers appeared on their shores. Her leaders (symbolized by Sitting Bull again, curiously) initially invite the strangers in because they like multiculturalism. As the newcomers multiply, the leaders (i.e., Sitting Bull) argue that the newcomers have not yet been integrated into Native culture well, and that Natives should adapt. This is a current argument in German society, with some conservatives and most on the right wing claiming that immigrants should adapt to German Leitkultur (leading, or guiding culture) and claiming that liberals (represented here by Roth) would rather have Germans abandon their Germanness than demand that immigrants assimilate. Leitkultur suggests that Germanness can be learned, after all. The problem with this is that, for most of these arguments, even if the immigrants tried to “learn Germanness” by assimilating, they would still be subject to racism: if you have dark skin, you will be considered a stranger, no matter if your Bavarian dialect is your first language and you can recite the entire first part of Goethe’s Faust from memory. When the young warriors in the Cherokee girl’s story are finally fed up and take a stand, it is too late and the Natives are massacred and pushed off of their land to Oklahoma. Here we have the motif of standing up to your traitorous leaders to protect your people that is en vogue among many neo-Nazis. Interestingly, the Cherokee girl repeatedly argues that Cherokee want to be “among ourselves” which is why she says “we recently expelled the blacks” (the Cherokee Freedmen) from the tribe. Again, to be “among ourselves” means that “the other” does not belong simply on the grounds of their, quasi species-specific, otherness. In this clip, the Cherokee are portrayed as righteously xenophobic racists who, simply wanting to be “among ourselves,” suffer first from Euro-American immigration/colonization and then from the presence of African Americans. They expel African Americans from the tribe because anybody qualifying as “not us,” as “the other,” should stay out simply because their “otherness” is inherent and irreconcilable, meaning: cultures don’t mix without conflict. The entire story promotes this stance as a defensive, protective measure, apparently proven right by the dreadful history of frontier conflict. The xenophobic rationale for the German context behind it is clear, especially since the clip’s opening soundtrack is Middle-Eastern music and the scene is set on Alexanderplatz, Berlin’s central square, symbolizing Berlin as one of the places with the highest percentage of immigrants in the country. So, both in terms of frontier history and of seeking to keep out the black ‘other,’ the Cherokee girl stands for a conservative and völkisch notion of peoplehood, and Claudia Roth for liberals who seek to destroy German culture and peoplehood through multiculturalism, as signified by a term currently very popular in these völkisch and xenophobic debates: Volksverräter (roughly: a betrayer of one’s own people/nation).